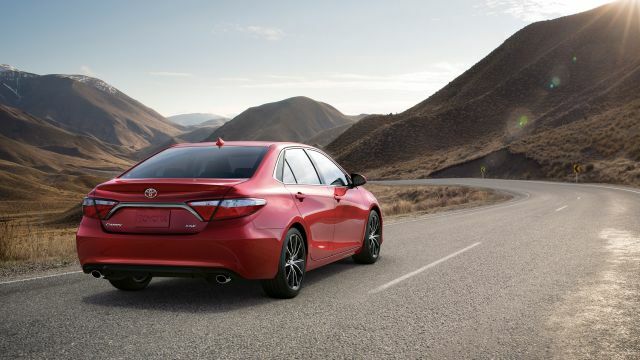 Sharp New Styling, Tighter Handling, More Digital Technology — This Is a Camry? Major revisions to styling, two new sporty models, and tweaks designed to sharpen its driving dynamics. Interior updates include wireless charging for selected smartphones. This is an unusually broad “midcycle” freshening to a midsize sedan that underwent a relatively recent redesign. Retained is the mechanical framework introduced with the all-new 2012 model. But Toyota moves quickly by automotive standards to enliven a car buyers rewarded for its room, comfort, and value but critics panned for its looks, handling, and dullness. Why should I wait for the 2016 model? Not much reason to. On the strength of the ‘15 revamp, it should coast all the way to its next full redesign with few alterations. So you’d pay more while getting essentially the same car as the ’15, a penalty that isn’t apt to me made up in resale value if you keep the car more than six years or so. The next all-new version of this five-passenger family car, by the way, appears on track for an autumn-2017 release as a 2018 model. Should I buy the current 2015 instead? If you need a spacious and reliable car in the near-term and realize the ’16 version is highly unlikely to change beyond a new color choice or two — though it is apt to cost more. Even with the midcycle revamp, your pocketbook will benefit from liberal factory incentives this automaker’s been shelling out to help keep this American’s No. 1-selling car. And compared to any previous version, you’ll get styling that’s unmistakably livelier, cabin materials tangibly richer, and road manners potentially more engaging. Much. The changes encompass more than the usual midcycle updates, which typically run to a reshaped grille and bumpers and slightly altered taillamps. Every panel on the body except the roof is new. The wheelbase – the distance between the front and rear axles – is unchanged. But the body is 1.8 inches longer overall and looks much racier. The new nose features a gaping lower grille, a trend this brand tapped for the latest versions of its Corolla compact car and Avalon full-size sedan. The look seems better integrated here, however. It’s complimented by slim new headlights with available LED low and high beams and vertical LED turn-signal/daytime running lamps set into the outer edges of the front fascia. The body sides shed slab forms for swooping character lines and fender blisters that represent a more modern, organic approach. With large two-tone taillamps united by a chrome garnish, the new rear end borrows heavily from the ES sedan sold by Toyota’s premium Lexus division. The tail’s horizontal themes compliment a half-inch expansion of this sedan’s rear track – the distance between the rear wheels – and underscore the new design’s more stable stance. All this is intended to stoke interest in a sedan facing serious threats from shapelier, more athletic rivals such as the Honda Accord, Ford Fusion, and Nissan Altima, all of which were redesigned for model-year 2013. They’re fighting for sales in America’s highest-volume car segment. Interior dimensions are unchanged; this remains among the more spacious vehicles in the class. But there are upgrades in the quality of materials on key surfaces. A thin-film-transfer liquid-crystal screen is introduced in the main instrument pod. And a quiet car gets even quieter, thanks to beefed-up window and door seals, outside mirrors reshaped to reduce wind turbulence, and carpeting with 30 percent more insulating material. The full 2015 model lineup was not announced in time for this review but should again include the popularly equipped LE and sporty SE models, topped by the upscale XLE. Seeking some youthful appeal, the SE was added with the 2012 redesign and now represents 45 percent of the sales mix. The automaker expands that idea for 2015 with introduction of the even sportier-looking XSE. Like the SE, the XSE is distinguished by a grille with a mesh insert instead of the other models’ polished horizontal bars, though it has model-specific wheels. Also getting a sporty edition is the Camry Hybrid lineup, with an SE model joining the returning LE and XLE trims. Yes, in an effort to improve ho-hum driving dynamics versus the likes of the Accord, Fusion, and Mazda 6. Suspension and steering changes are intended to improve control. The structure is fortified in key areas to enhance rigidity for better handling and ride quality. The electric power steering is retuned for better feel, response, and stability. Improvements in brake feel are touted, too. 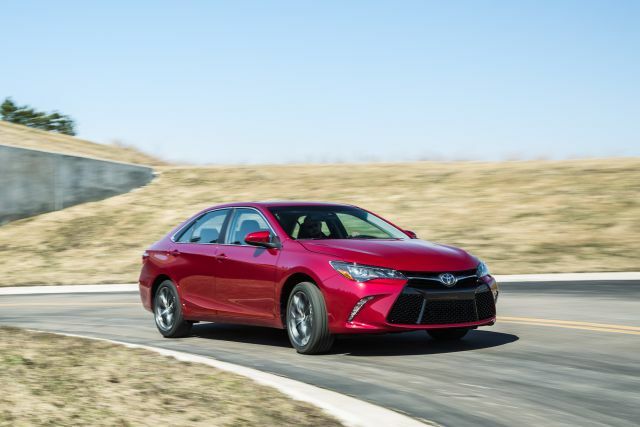 Going beyond the SE model’s mild suspension upgrades, the XSE gets unique suspension components and steering calibrations that make it “the sportiest Camry yet,” the automaker says. The new Hybrid SE also has specific suspension, steering and stability-control settings. Under its new hood, a choice of four- and six-cylinder engines repeats, along with a hybrid that combines gas and electric power. This manufacturer is developing a turbocharged four-cylinder, but if it shows up in this car it probably won’t be until after the model-year 2017 redesign. Most 2015s will again come with a 2.5-liter four-cylinder. Detailed specifications were not released in time for this review, but the 2014 version of this engine had 178 horsepower and 170 pound-feet of torque. (Think of torque as the force that gets a vehicle moving, horsepower as the energy that sustains momentum.) This engine’s laudable combination of performance and fuel economy serves buyers well. But some observers speculated it would adopt direct fuel injection as part of the midcycle refresh. That’s a fuel-saving, power-boosting technology most rivals already employ. Along with the Accord, Passat, Nissan Altima, Chrysler 200, and Subaru Legacy, this will remain among the midsize-class holdouts that continue to offer a V-6 engine. It’ll again be a 3.5-liter and should repeat at 268 horsepower and 248 pound-feet of torque. Expect the V-6 to again be available only in SE, XSE, and XLE models in place of the four-cylinder and to provide a surplus of smooth power. Both these engines will continue to link with a well-matched six-speed automatic transmission. It retains manual-type gear control via the floor shift lever that, in the SE and XSE, is complemented by steering-wheel paddles. Likely to repeat at 200 net horsepower, the Hybrid would again be capable of driving on gasoline, electricity, or any combination that sensors decide provides the best blend of fuel economy and power. This isn’t a plug-in hybrid, though a dashboard button can set it in EV (electric vehicle) mode to lock in electric-only propulsion for short distances at low speed, battery charge permitting. A continuous variable transmission (CVT) will again perform the duties of an automatic transmission but without individual gear ratios. The automaker had not made any version of this car available for test drives in time for this review. EPA fuel-economy ratings were not released in time for this review, but without major powertrain changes, they should maintain levels established by the 2012-2014 models. That would put versions with the 2.5-liter four-cylinder at 25/35/28 mpg city/highway/combined, maintaining them among the higher-mileage midsize sedans. By contrast, models with the V-6 would remain slightly less fuel-efficient than the turbocharged four-cylinder engines rivals use in place of six-cylinders. Expect ratings of 21/30/25mpg city/highway/combined. The Hybrid LE should repeat at 43/39/41 mpg city/highway/combined. That’s likely to again beat the slightly heavier Hybrid XLE’s – and possibly the Hybrid SE’s — ratings of 41/38/40 mpg. Does it have new features? Yes, and in fact builds on a features roster that already offered most everything the midsize-car shopper could want. Most upgrades aim to present these features in a cabin pushed upscale through use of better plastics, padding, and upholstery, including leather/Ultrasuede combinations. Among key changes are a larger center-console with an available wireless charging system; Toyota had not detailed which smartphones are compatible with the system. The instrument panel features a new 4.2-inch TFT screen between three-dimensional gauges on the SE, XSE, and XLE models. The screen’s color animation displays a range of vehicle functions and coordinates with the multimedia system to display audio, navigation, warnings, and communications. Model-specific details will be released closer to the on-sale date, but we urge this carmaker to use the midcycle refresh to expand availability of some key features beyond, say, just the SE, XSE, and XLE models. For example, it could make blind-spot detection available on the base LE model. This useful safety adjunct warns of unseen vehicles in adjacent lanes. Similarly, it could extend beyond the XLE (and likely the XSE) its Safety Connect system, which provides emergency assistance, automatic collision notification, and stolen vehicle location assistance. A power driver’s seat is standard on some less expensive cars so it’ll be interesting to see if one is finally included in the base price of the 2015 LE. A power moonroof should remain available for LEs and SEs and continue as standard on XLEs and the new XSE. All models will likely come with a rearview backup camera. But will an option package with proximity unlocking and pushbutton ignition be extended to the LE? Thus far, it’s been an option on the SE and four-cylinder XLE and standard on the V-6 XLE. Expect a navigation system to remain available on all but the LE models. The system is a component of the carmaker’s Entunes infotainment setup. Entunes works with smartphones to furnish in-car access to such Web-based services as Pandora Internet radio and text messaging. In this car, Entunes has been included in combination with an elementary navigation system as an upgrade over the basic audio system and has been standard on V-6 SE and XLE models and optional on four-cylinder SE’s and XLE’s. All 2015 editions of this sedan will come with a 6.1-inch dashboard touchscreen. But product planners may persist in reserving the most complete infotainment option for V-6 XLE and XSE models. This one includes Entunes, a 10-speaker JBL audio setup, and a 7-inch touchscreen of greater clarity than the 6.1-inch screen. To get leather upholstery and heated front seats, buyers have had to add them as an option to a four-cylinder XLE or buy a V-6 XLE, where they’ve been standard. For 2015, they’re likely to be standard on the XSE, as well. It’s a good bet all trim levels will again come standard with air conditioning, cruise control, outside temperature gauge, and power windows, locks, and mirrors. Same for Bluetooth hands-free mobile phone connectivity and a USB iPod interface. How will 2015 prices be different? Pricing was not announced in time for this review but expect a base price range of around $23,900-$31,000. (Estimated base prices in this review include the manufacturer’s mandatory destination fee, in this case, around $800. Among the top-selling midsize cars – Camry, Accord, Altima and Fusion – this one has benefitted from the most generous customer cash incentives. This is partly an effort to maintain its marketing edge as America’s most popular car. Helping those sales numbers are examples sold to fleet buyers, including rental-car agencies. Indeed, Toyota generally has been more willing than its import rivals to court fleet orders. The downside is a potential hit to residual values, which traditionally trail only those of the Accord in the midsize segment. Whether the automaker will continue incentives and fleet sales at this pace is open to conjecture. But chances are good that come price-negotiation time, 2015 Camry shoppers will indeed enjoy some advantages not available in rival showrooms. Most sold at retail will continue to be LE’s and they should start around $24,000 with standard features such as variable intermittent windshield wipers and the steering-wheel Bluetooth and audio controls. Estimated base price of the ‘15 SE is $25,000 with the four-cylinder engine and $29,000 with the V-6. In addition to the unique exterior trim, the SE will continue with handling-tuned steering and suspension and front bucket seats with extra side bolstering for support in fast turns. Estimated starting price for the XLE is $26,600 with the four-cylinder engine and $32,300 with the V-6. Dual-zone automatic climate control and power front seats should again be among standard XLE upgrades. The new XSE is likely to be positioned as a sport-luxury flagship; expect it to start around $27,500 with the four-cylinder and $33,000 with the V-6. Estimated base price for the ’15 Hybrid is $27,900 for the LE model and around $29,500 for the XLE and SE versions. Except of course for powertrains — and special hybrid-data instrumentation — the Hybrids will be similarly equipped to their gas-only LE, SE, and XLE counterparts, with the moonroof and leather-upholstery options probably exclusive to the XLE. A full redesign originally on track for model-year 2017 has apparently been pushed back a season as Toyota wrestles with developing the modular engineering architecture that’ll underpin this and a host of other its other passenger vehicles. Regardless of the precise timing, a key question is whether the next-generation will join such rivals as the Fusion, Sonata, Malibu, Mazda 6, and Kia Optima with a transition to an all-four-cylinder-engine lineup. Here, the traditional choice of four- and six-cylinder engines is partly because this platform has been shared with lots of corporate cousins, from the Highlander crossover SUV and Sienna minivan to the Lexus ES350. Those vehicles need a V-6 to compete in their classes. But given tightening federal fuel-economy regulations, some engineering distance may come between the next-generation of this sedan and some of its platform-mates. The automaker could pitch the larger Avalon sedan, for example, as its V-6 passenger mainstay and base future minivans and crossovers off its beefier platform, as needed. An all-four-cylinder Camry lineup would have direct fuel injection across-the-board. It would include a gas-electric hybrid, possibly joined by a plug-in hybrid version. Whether the carmaker considers turbocharging appropriate for this family car, only it knows, though the company is preparing a turbo four-cylinder for use in its Lexus IS sedan as well as the Toyota RAV4 compact crossover SUV. As for overall design, expect the next-generation to continue trending toward styling that in Toyota’s view is more contemporary. Designers will be under pressure to reduce the car’s weight, so will likely reduce its exterior dimensions with no sacrifice in much passenger and cargo volume.